The shores of Lake Washington are a vital nursery for young salmon. However, most of the shoreline has been altered with piers and other overwater structures, bank armoring, and reduced native vegetation. At the south end of the lake the Washington State Department of Natural Resources (DNR) manages approximately three acres of filled shorelands. 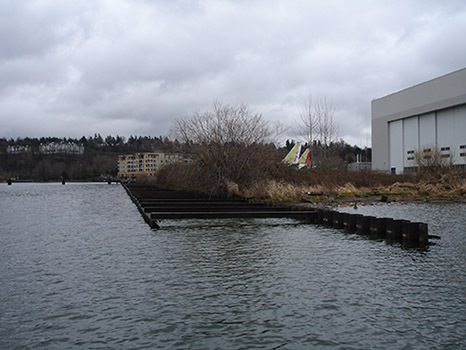 The property is located adjacent to the Renton Boeing plant and is adjacent to the mouth of the Cedar River, a critical migratory corridor for Chinook salmon. The property was created in 1965 when 150,000 cubic yards of fill was placed into the lake. The fill was placed alongside a flume made of two sheet-pile walls that was used to release cooling waters from the Shuffleton Steam Plant. The derelict flume was approximately 650 linear feet and made up of two sheet pile walls that were approximately 20 feet apart. The property was overgrown with Himalayan blackberry and other invasive plants and the shoreline was littered with concrete and other debris. Three dolphins made up of 21 creosote-treated piles were located on the eastern side of the property and Boeing has two outfalls that cross the property and released stormwater along the nearshore. Please find project location map here. 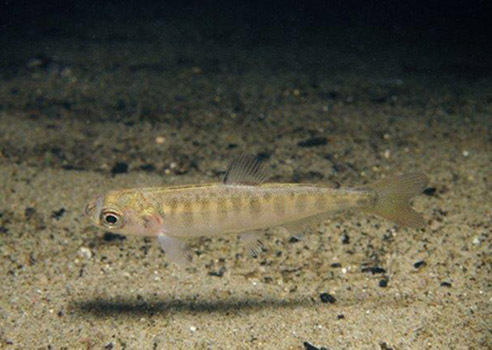 Reestablish the nearshore and upland habitat and improve the water quality for the rearing and migratory juvenile Chinook salmon. Chinook salmon are listed as ‘threatened’ under the federal Endangered Species Act, so restoring this migratory and rearing corridor is a top priority in the WRIA 8 Chinook Salmon Conservation Plan. Every year between January and May of each year, juvenile Chinook salmon travel down the Cedar River, through Lake Washington and out into Puget Sound. The juveniles utilize the shoreline at this site feed and grow before continuing their journey to the ocean. The site’s proximity to the Cedar River made it an ideal location for an enhancement project due to studies showing that the juveniles tend to rear in preferred habitat near the mouth of the river. Enhancement of the site has accomplished priority actions under the conservation plan by increasing overhanging vegetation and reducing bank hardening by restoring important shallow water habitats closest to the mouth of the Cedar river - where such habitat is most heavily used by juvenile Chinook salmon (Tabor 2006). Checks out Roger Tabor, a US Fish and Wildlife Service biologist explain the preferred habitat of juvenile Chinook salmon in Lake Washington in this the video. Planning and design of the project occurred between spring 2009 and spring 2014 These steps included coordinating with partners, the public, a feasibility study, conceptual design, final design of the project, and initial monitoring studies. 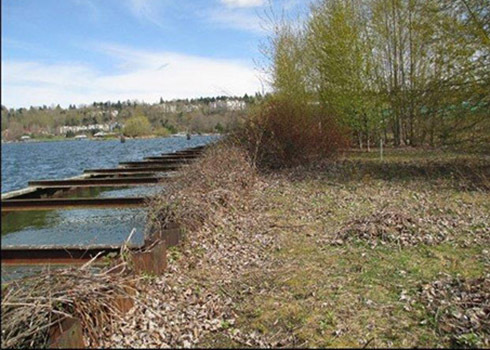 As part of the ongoing effort to enhance Lake Washington, DNR received a grant for planning design and permitting of the restoration project from the Salmon Recovery Funding Board (SRFB), as well as funds from the Washington Department of Ecology, and the DNR Aquatics Restoration Funds. You can find the 2014 design drawing here. Work began in late spring 2014 and was completed in January 2015. The construction of the project is a partnership between DNR, Washington State Department of Transportation (WSDOT), and The Boeing Company. 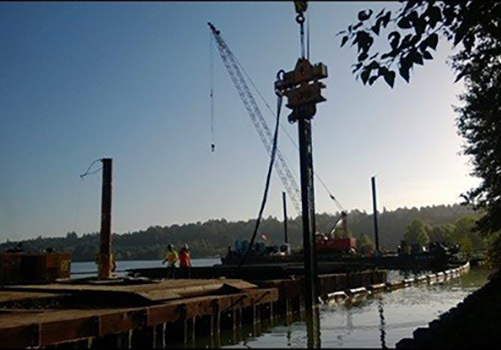 WSDOT is supporting the project as partial mitigation for environmental impacts of constructing the new SR 520 floating bridge across Lake Washington (the SR 520 Bridge Replacement and HOV Program). 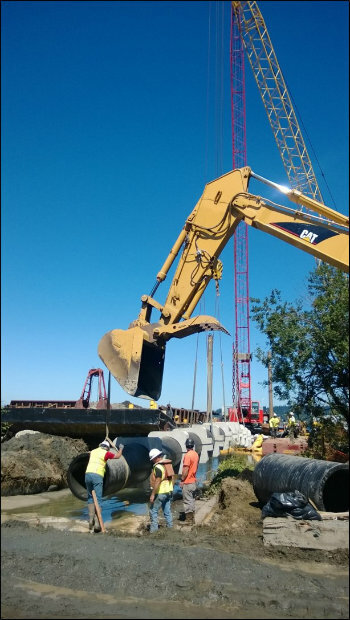 WSDOT receives mitigation credit for aquatic impacts for the funding that they provided for the construction of the project. WSDOT will maintain and monitor the site for 10 years following the construction of the project. 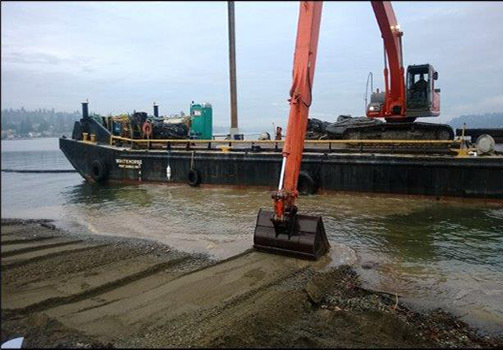 Boeing funded the replacement of two aging stormwater outfalls which allowed DNR to move them into deeper water to prevent stormwater from disturbing the newly restored shallow sand and gravel habitat along the shoreline. Removing sheet pile wall one sheet at a time. Placement and grading of new sandy beach materials. DNR is currently working with US Fish and Wildlife Service to complete salmon monitoring along the project shoreline. The monitoring occurred three years before construction and is occurring three years after restoration. The data will allow us to report pre and post-project fish counts at the project site and two control sites. Night snorkeling of five different transects occurs twice per month from late January through early June. Snorkeling occurs at night to minimize the effect the snorkeler has on the behavior of the salmon and so they can be more accurately counted. 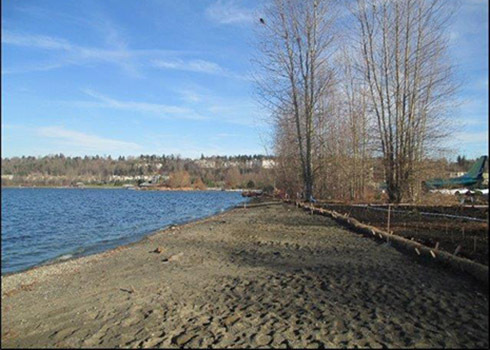 The transects include the site flume structure, a sandy shoreline along the site, a cobble/debris shoreline on the site, a bulkhead at Gene Coulon, and the Gene Coulon swim beach. The linked graph, from the 2016 Progress Report, illustrates a higher density of juvenile Chinook utilize the sandy substrate areas. With the removal of the flume wall we are seeing a large increase of juvenile Chinook salmon using the new sandy shoreline.